When Barry Jenkins, the African-American director of Moonlight, was accepting the award for Best Motion Picture Drama at the 2017 Golden Globes, he said, “if you have seen this film and told a friend, all I say is please tell a friend, tell a friend, tell a friend,” and it’s good advice indeed. This heart-wrenching social document covers issues about being gay, the struggle with drug abuse, the effects of bullying and the general disenfranchisement felt by blacks in the good ol’ U.S. of A. From his opening shot, James Laxton’s cinematography takes us through a luminous visual masterpiece that embraces the heart of Tarell Alvin McCraney’s powerful play In Moonlight Black Boys Look Blue. Told in three chapters, each revealing the struggles of a young black man as he passes from childhood, through adolescence and on to manhood, the story is set in a predominately black housing project in Miami. We meet a young boy referred to as ‘Little’ (Alex Hibbert), who’s being chased by a bunch of kids who taunt him because he is ‘different’. He is rescued by the local drug dealer Juan (Mahershala Ali), who takes him under his wing and provides a safe sanctuary as ‘Little’ grows up to become Chiron (Ashton Sanders) and eventually ‘Black’ (Trevante Rhodes). The years are brutal, especially as he has to deal with his drug-addicted mother Paula (the excellent Naomie Harris) and the feeling of isolation generated by his emerging sexuality, which sets the already lonely, almost mute, child even further apart from the other kids. And things don’t get any better when ‘Little’ morphs into Chiron at high school. You sense his fear of being in such a place at such a time, constantly under threat. Even when Chiron becomes the pumped-up adult ‘Black’, the effect of his scarifying school years stays with him. “Give me the child…” as the Jesuits would say. 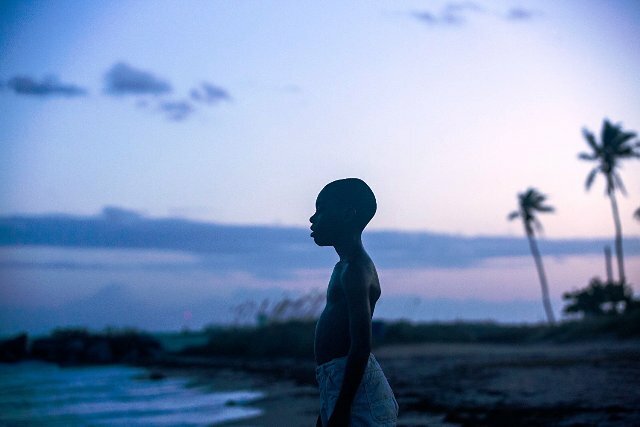 Moonlight is a mesmerising 111 minutes in the cinema, helped by superb performances and an eclectic music soundtrack that incorporates hip-hop, R’n’B, classical and the haunting score of Nicholas Britell. It leaves you feeling drained yet somehow exhilarated. It’s very different territory to that covered in La La Land (which will probably clean up at the Oscars, as it did at the Golden Globes) but Moonlight will continue to resonate long after the awards season and will probably have a more lasting effect on its audience. It’s about so much more than the difficulties of growing up gay in a straight world; it’s about the difficulties of growing up black in a white world.